Make your stay an Adventure while being close to all the action of the Dells! We have HEAT for the Winter seasons! Winter Special- Just $99/night on most stays. Holidays and wknd rates are as posted. A Surcharge of $15 will be charged after you book to offset the VRBO fees charged to the host for this special. A request will be sent to you for the payment after booking. By booking you agree to this charge. Thank you. Arrggh! 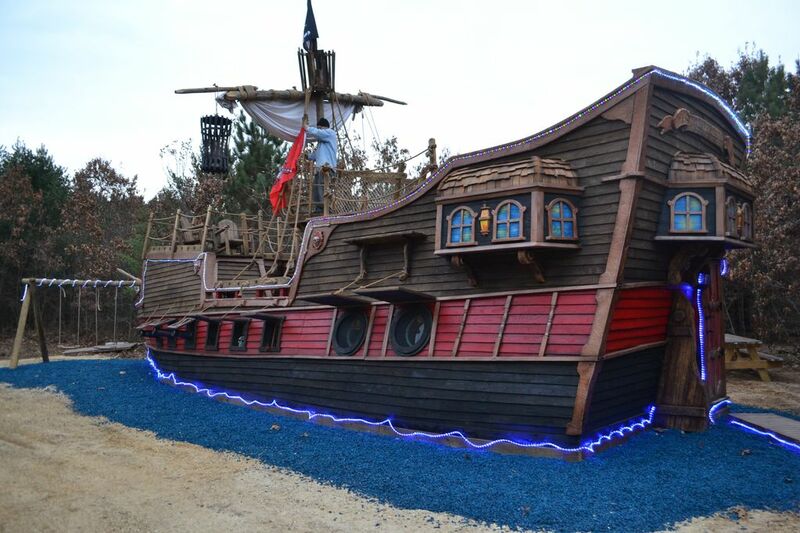 Stay on a "real" pirate ship fully decorated in the theme of the Caribbean... Come aboard the "Passing Wind" and sail into an adventure while you enjoy your stay. Don't just stay in a hotel... make your stay an Adventure too! Sleeps 6- Great for kids and couples! Bring out your inner child! Just 10 mins from the Dells and close to Mirror Lake, Devil's Lake, and more! Try one of our guided climbing or kayak tours. Ice climbing and snow shoeing tours in the Winter too! Most of this awesome ship is outdoor space. There is NOT a living room or large sitting area inside. The mid-ship deck is private and has seating and a table and the 2 upper decks are awesome for sunning on and relaxing. Chairs are provided. Note: Captains quarters and the crew bunk room are a short walk across the lower(mid-ship) deck outside from each other- about 15 feet. They are not connected. This may be an issue with younger kids who may not like to be too far away from Mom and Dad... A/C is only in the Captn's quarters(main room) not the crew bunk room. There is fan in there in Summer. **Pirate guests use a shared(with other guests) bathhouse that is a short walk/drive(about 150 yards) away with flush toilets/showers during SUMMER ONLY. Showers and water system is SHUT down in the Winter- NO showers approx Nov. 1st. Toilets are still open in the bath house a short walk/drive in the Winter. Swing set, slide and more! Large sun decks and 10 acres to explore! Note: Captains quarters and the crew bunk room are a short walk across the lower deck outside from each other- about 15 feet. They are not connected. Bathrooms with flush toilets and showers are a short walk/drive(150 yards) away with private rooms(see pic). They are CLOSED in the Winter(approx Nov. 1st) for showers- Just toilets in the bath house in the Winter. NOTE: This is a Camping/Glamping lodging experience. If you are opposed to Bugs, Mos-Skeeters, Ants, Mice(inside and out), water dripping inside, warm weather, walking to be bathroom, and/or being in the out-of-doors then you may be better off getting a hotel room in the Dells. NOTE: The bathhouse with showers and flush toilets will be shut down for the season on approx. Nov. 1st. There will be toilets in the Bath house BUT NO running water in the Winter- you will need to bring your own drinking water and cleaning water. NO Showers in the Winter. Thanks WINTER RATE WILL BE $99-120/NIGHT - 2 NIGHT MINIMUM- Toilets will be in the bath house. Winter- NO showers. There is a local recreation center a short drive away with a pool, hot tub, and showers for a relaxing visit. We have HEAT for the Winter season. Bring warm bedding for the Fall/Spring seasons.... or a small heater.... Our heaters go in the Ship sometime in October. Note: the unit must be cleaned and made ready for the next guest as requested in details to be emailed to the guest. the unit still needs to be cleaned up fully after stay... or a charge will be made out of your damage deposit. Cancellations: Vacation properties are often booked many months in advance and the property will be held for your use. While the property is being held for you, it obviously cannot be rented to someone else. Therefore, like cruise, tour packages and airline tickets, when booking/reserving a vacation rental home, you will need to make a full or partial payment upfront in order to hold the property. Normally this is not a problem, BUT if you need to cancel your trip (especially at the last minute), you should know that you will forfeit a portion or all of your rental fees.